This new path in liver cancer treatment is becoming more widely traveled. Nonresectable primary and metastatic liver cancers carried a bleak prognosis with limited treatment options—until recently. Encouraging results of several recent trials suggest radioembolization is achieving the previously elusive goal of destroying hepatic tumor cells while sparing surrounding tissue. The procedure has been approved in the United States for more than a decade, but the past year has witnessed a surge in utilization. Two commercially available agents are FDA-approved for the treatment of liver cancer. TheraSphere, made by MDS Nordion Inc, was approved in late 1999 as a humanitarian use device for hepatocellular carcinoma (HCC), while SIR-Spheres, made by Sirtex Medical Ltd, were sanctioned as a first-line therapy for colorectal liver metastases in 2002. In the past two years, radioembolization for liver tumors has become available in most teaching hospitals and is rapidly being introduced into all large radiology departments, including community hospitals. However, until recently, the procedure was offered in only a handful of medical centers. In 2010, at least seven articles per month on the subject have appeared in the PubMed database compared with two per month in 2007. According to American Cancer Society statistics, HCC is the fifth most prevalent primary cancer and the second most frequent metastatic site for all cancers. For colorectal cancer, it may be the only site of metastasis for one in three patients, according to Memorial Sloan-Kettering studies. Chemotherapy and external beam radiation, the current options for treating unresectable liver tumors, are limited in effectiveness and may trade quality of life for a few additional months of life. Microspheres target liver tumors by taking advantage of their hypervascularity. Metastatic liver tumors larger than 3 mm receive 80% to 100% of their blood supply from the hepatic artery while normal liver tissue is predominantly fed by the portal vein. The microspheres are delivered via a fluoroscopic embolization procedure in which millions of 30-micron beads are infused through a catheter into the hepatic artery. The beads become embedded in the liver, and the therapeutic dose is delivered over a period of about two weeks. The beads are bonded with yttrium-90 (Y-90), a beta-emitting radionuclide that acts locally because its relatively low energy means the beta particles travel at most 11 mm in the liver . This allows the beads to embed in and irradiate the tumor while sparing healthy liver tissue. And there is the need for meticulous attention to technical detail by a team that includes an interventional radiologist, an anesthesiologist, a nuclear physician, a radiation physicist, an interventional technologist, nurses, and radioisotope technologists. Coordination and timing are so crucial that Sirtex provides a representative to oversee the entire procedure to confirm that the entire team is present, the precise dose is on hand, and the sophisticated delivery system is functional. The representative provides in-service training for the staff and supplies printed educational materials for patients, family members, and referring physicians. Prior to the treatment, a technetium-99m (Tc-99m) macroaggregated albumin (MAA) scan is performed to map the area targeted for treatment. No more than 30 Gy of radiation should be shunted to the liver. A contrast CT scan is also obtained to determine the volume of the liver that will receive treatment, according to Ongseng. Once preparation for the procedure is complete, the treatment itself is relatively quick, with only 30 minutes needed for microsphere delivery. Treatment is often performed on an outpatient basis while patients remain conscious. 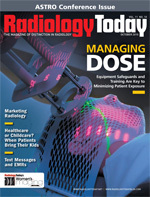 An authorized user, usually a nuclear medicine specialist, actually injects the dose. “This is delivered via a catheter inserted by the interventional radiologist and is given by several short pulse injections of Y-90 until the dose is completed,” explains Ongseng. Chemotherapy is often used before or after therapy with microspheres. Treatment is typically performed in separate sessions for each affected lobe of the liver. “Most patients have bilateral disease, so in the second [session] we treat one lobe of the liver and in a separate third session, the other,” notes Patel. Patel believes that “[Y-90 microsphere therapy] is gaining widespread recognition as one of the most promising techniques currently available in patients whose known malignancy is limited to the liver. Many such patients have failed chemotherapy and are not candidates for external beam radiation. Patient toleration is by and large excellent. Patients often experience a spike in bilirubin following microsphere treatment. Bilirubin levels exceeding 2 mg/dL prior to treatment suggest susceptibility to radiation-induced liver failure after treatment. “There are certain restrictions in that we like to see the patients have a reasonable performance status, that they’re not so end stage that they would not be able to see the benefits of the procedure. Some patients come to us very end stage, and those patients, they’re not going to see any of the benefits. We prefer treating cases where liver function is not severely deteriorated. Those are probably the two main things,” says Patel. Patients who received microsphere therapy have shown good response in clinical trials. “Right away there is no change [in the patient], but in our experience, there is a very good outcome. The quality of life improves and the life span also improves, particularly for neuroendocrine tumors,” Ongseng says. Neuroendocrine tumors are not yet FDA approved for treatment with microspheres, but they have been used in small studies with promising results. Ongseng believes growing awareness of the procedure among oncologists is the likely explanation for the sharp increase in requests for microsphere therapy compared with a few years ago. “The referring oncologists now know the availability and effectiveness of the treatment, so there is more referral to us,” he says. Still, microspheres remain a relatively new therapy, offering high-dose directed tumor ablation with little toxicity to the surrounding tissues. But if awareness is key, as Ongseng suggests, expect further growth in this treatment strategy for nonresectable hepatic tumors. — Arkadiy Kheyfits is a freelance writer based in Brooklyn, N.Y. He is a first-time contributor to Radiology Today.